As reported in Clinical Case Report, a 53-year-old woman presented to the hospital because of difficulty in removal of her IVAP. The patient was hospitalized for a mass on the right breast and diagnosed with breast cancer by pathology. She was healthy prior to diagnosis. There were no contraindications against operation and we performed a modified radical mastectomy on May 5th, 2012. Postoperative pathology indicated that her tumor was invasive ductal carcinoma of breast, while her immunohistochemistry showed that estrogen and progesterone receptors were positive in 70% and 30% of cells, respectively. 20% of cells were Ki-67 positive and all tumor cells were negative for human epidermal growth factor receptor. She received IVAP implantation on May 25th, 2012. After 6 cycles of chemotherapy, radiotherapy was applied. Afterwards, she underwent periodic follow-up in out-patient for 4 and half years in our hospital. According to her pathology, immunohistochemistry, and out-patient, we concluded that her IVAP could be removed. There was no evidence of abnormity on X-ray, so an operation to remove her IVAP was performed. During the operation, we found that the IVAP catheter was stuck with the catheter unobstructed. At first, we considered that this might be due to fibrin sheath formation or a thrombus in the catheter tip, so we injected urokinase 5 ml 1000U/L into the catheter once a day. Three days later, we tried again but again failed to remove the IVAP. We consulted with experts from the Invasive Technology department who recommended vasography. 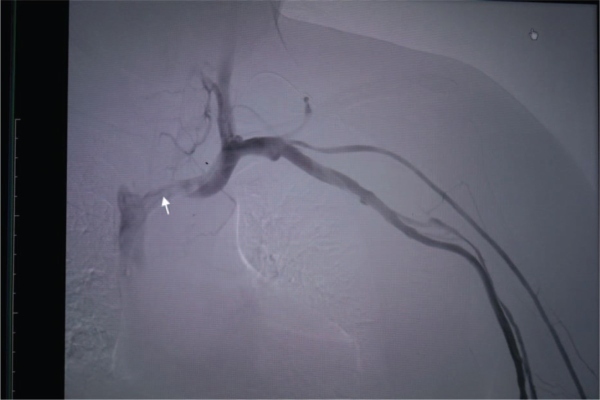 We found a filling defect in the left brachiocephalic vein suggesting thrombosis which fixed the catheter in the vein and made it difficult to pull out. Removal of the thrombus would have been very dangerous, because it was impossible to completely prevent pulmonary embolism caused by thrombus shedding. In the end, we decided to leave both thrombus and catheter in place and to only move the IVAP port. The patient was discharged after the international normalized ratio was between 2 and 3. The patient was followed-up for 20 months by telephone. 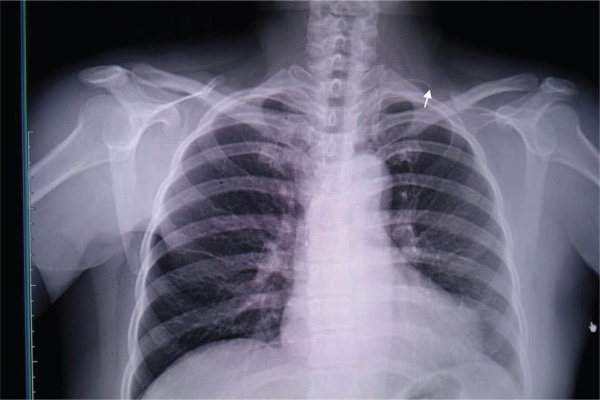 The catheter remained in her body and chest X-rays, taken during each out-patient review, showed that the catheter was normal and had no fracture or migration. There were no left brachiocephalic vein thrombotic complications, such as edema of head and neck, dyspnea, syncope, pectoralgia, or cough. The thrombosis showed no change and the patient took warfarin as directed, one and a half tablets once a day, and an international normalized ratio that remained between 2 and 3 for half a year. The patient's situation was generally good and there were no psychological impacts or other chief complaints. 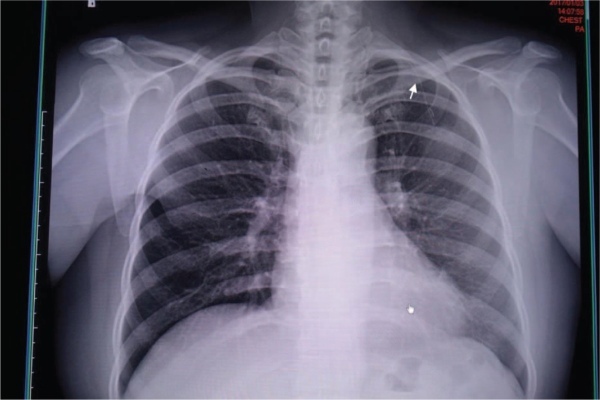 The report was approved by our hospital's institutional review board and informed written consent was obtained from the patient for publication of this case report and accompanying images.